Moving onto bridal styles and the Deep V is one of my current favourites. It works so well as a slightly risqué counterpoint to gowns with demure sleeves and then a splash of jeweled detailing is a perfect finishing touch. If you’re a little worried about pulling this look off, high necked and illusion-backed wedding dresses are also rightly popular and moving on down the gown, skirts with pretty overlays will be loved by 2015 brides. This look is light and feminine and altogether gorgeous. After Solange Knowles’ wedding, there’s going to be lots of 1970s inspiration this year. Big brimmed hats a la Amal Clooney, vibrant colours, wedge sandals and retro motifs are will all be making a comeback. Put some prawn cocktail on your menu now! One of the big colour trends for 2015 will also be taken from the ‘70s and will move us on from the golds and silvers of previous years. Mixed metallics look fantastic and give you so many options for every decorative element of your wedding from stationery to flowers and cakes encrusted with precious metals. Bring your wedding to life with bold bronzes, coppers and golds. At the other end of the spectrum, cool grey is another colour to fall in love with. You can work grey into your wedding as a foil to beautiful blush pinks and cool mints or use it alongside black accents and gorgeous silver-grey succulents are a stunning addition to bouquets and buttonholes. Layers of ethereal grey tulle work wonderfully for bridesmaids and sparkling accessories complete this look perfectly. We’ve had bunting, the paper pom-pom and the honeycomb ball so 2015 is going to be the year of the pinwheel! These fab finishing touches are just brilliant if you fancy a bit of bridal DIY and a good online craft tutorial will be all you need. 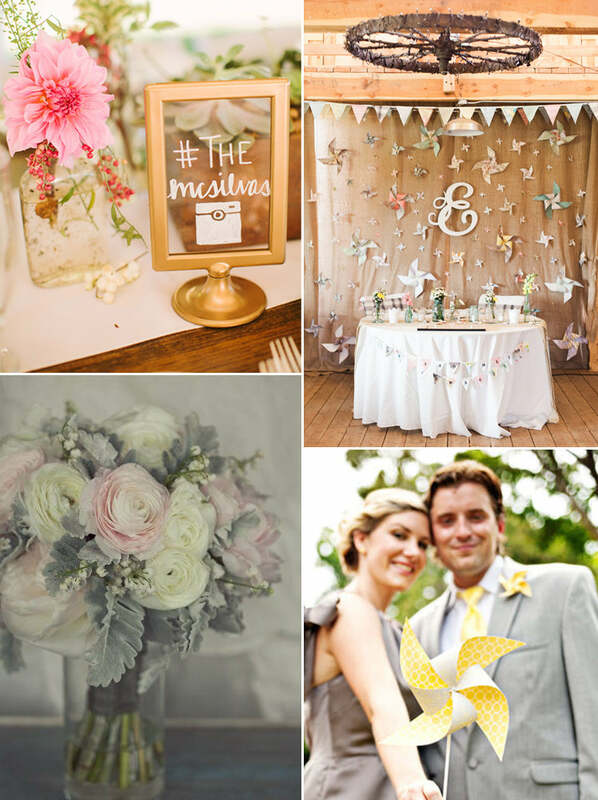 Huge pinwheels make brilliant backdrops and small versions look great on tables, chairbacks and on cakes. How about using pretty pinwheels as photography props or even buttonholes? Now we all love to share photos with each other via social media, the wedding hashtag has become quite the big day must-have. It is genuinely a brilliant way of making sure that you see all the snaps your guests have taken and it also brings people who might not have met before together online as well. You’ll be creating your own little community right there and that’s a beautiful thing! Finally, here’s a little detail that’s worth keeping an eye on for your 2015 wedding. Banish boring envelopes and get creative with calligraphy! We all know that your wedding stationery gives guests their first clue about your wedding so why make them wait until they open the envelope? Give your 2015 wedding some style from the very first moment.